One of the 250 keyhole gardens that will be constructed as part of this project. Seasonal survey data reveals that keyhole gardens heavily increase the production, diversity and consumption of vegetables. According to Terre des hommes, at baseline, 70% households consumed vegetables that they produced; after two years of keyhole gardening, consumption of vegetables by the households increased to nearly 90%. 34% of rural children under 5 years in West Bengal suffer from stunting, 22% from wasting and 25% of women of reproductive age have a Body Mass Index (BMI) below the recommended cut-off value of 18.5 kg/m2. For drinking water, the population of the Canning-II Block in West Bengal depends on a limited number of shallow tube wells, on average one per 300 - 400 inhabitants. These tube wells are often poorly located, requiring villagers (mostly women and girls) to walk up to 2 kilometres to reach them. This amounts to an average round trip time of 45 - 60 minutes during normal weather conditions. In addition, existing tube wells draw water from the upper aquifer which is generally saline and unfit for consumption. Many of the existing tube wells are constructed without raised platforms to protect them during floods, thus increasing the risk of contamination and often making access more limited. Only half of the population of South 24 Parganas District has access to adequate sanitation facilities. Poor access to safe drinking water and sanitation, together with inadequate dietary intake, result in recurrent illnesses, in particular waterborne diseases such as diarrhoea. Within South 24 Parganas district, a prevalence of 5.9% of U5 children were found with diarrhoea over the previous two weeks and only 62.8% of children received ORS treatment at home. Reducing the percentage of U5 children with low weight-for-age from an estimated 28% to 18%. Reducing the prevalence of diarrhoea among U5 children by 20%. Ensuring that 65% of the population in the target area has access to improved drinking water sources in all weather conditions. District Level Household and Facility Survey (DLHS) of South 24 Parganas district 2012-13. NB. Baseline figures to be confirmed through a baseline survey. Although Gujarat is one of the richest states in India, according to the National Family Health Survey 2015-2016, more than a third of Gujarati children suffer from chronic malnutrition (39% stunted), and more than one-quarter suffer from acute malnutrition (26% wasted). 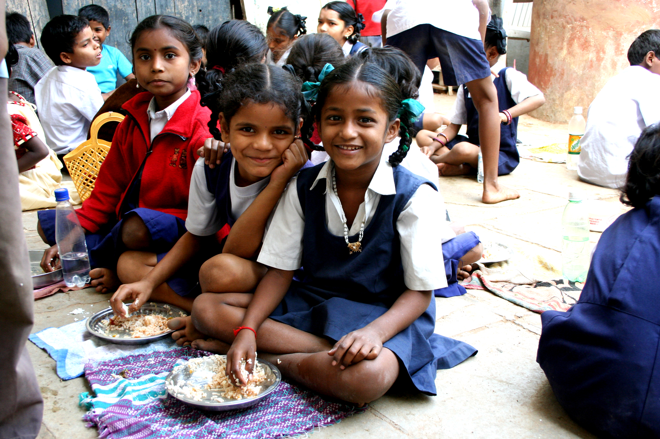 This project will attempt to tackle this issue by serving PATH’s fortified Ultra Rice® in school lunches in Ahmedabad via the government’s midday meal programme. Through this project, at least 129,000 school children will receive the benefits of sustained delivery of vital micronutrients such as iron, folic acid, vitamin A, and B complex vitamins. Mother learning how to use a Mid-Upper Arm Circumference (MUAC) tape to track the nutritional status of her child. Through this project, mothers in 110 villages will learn how to use MUAC tapes resulting in early referral and treatment of acute malnutrition. Photograph courtesy of Action Against Hunger. The Kishanganj and Shahabad blocks of the Baran District, Rajasthan have experienced high rates of severe acute malnutrition-related mortality and morbidity. A survey conducted by Action Against Hunger in the Kishanganj block in June 2014 on children between 6 and 59 months revealed an overall prevalence of global acute malnutrition of 33.7% and severe acute malnutrition of 7.6%. This project attempted to tackle acute malnutrition by improving knowledge and understanding within the community through an assisting behavioural change strategy and by strengthening the mechanisms for timely identification, treatment and monitoring of children with severe acute malnutrition. Following the start of implementation, Action Against Hunger realised that levels of malnutrition in the target area were significantly lower than expected (e.g. during the project year 1,901 children were treated for severe or moderate acute malnutrition - against an expected caseload of 13,100 children). Action Against Hunger believe that their previous and ongoing work in the target area has contributed to this impressive fall in malnutrition levels. Increased the percentage of households with knowledge on nutrition, Infant and Young Child Feeding (IYCF) and Water, Heath and Sanitation (WASH) practices for under-five children from 0 to 44% (target 30%). Increased the percentage of government health workers conducting regular screening for severe and moderate acute malnutrition from 10 to 73% (target: 60%). Increased the percentage of government service providers with increased knowledge on nutrition IYCF & WASH practices from 0 to 80% (target: 75%). Tanzania suffers from high rates of micronutrient malnutrition with one third of children deficient in iron and/or vitamin A (as per Micronutrients: Results of the 2010 Tanzania Demographic Health Survey). One of the most cost-effective solutions for improving intakes of essential vitamin and minerals is the fortification of staple foods and condiments. Tanzania has a mandatory wheat and maize flour fortification programme. However, low capacity to produce and monitor these foods is limiting the programme from benefiting vulnerable populations to its full potential. This project aimed to strengthen Tanzania’s food quality monitoring and processing capacity thus improving access to adequately fortified foods. Arranging 5 National Food Fortification Alliance meetings, bringing together key stakeholders to discuss progress on fortification projects, regulations and other important issues. Relaunching the fortification Management Information System (MIS) and providing MIS training to government and industry representatives. By the end of the grant period, 16 industries were inputting data into the MIS on a monthly basis, with 8 doing so for at least 6 months. Providing refresher training to 5 food analysts and 20 inspectors to increase their capacity to perform field inspections. Encouraging industries to procure premix from a list of quality assured suppliers. By the end of the grant period, 12 industries were sourcing premix from certified sources. Training government inspectors and representatives of 26 industries on quality assurance procedures for micronutrient fortification resulting in a significant improvement in the quality control and quality assurance systems at inspected factories (as per the Tanzania Food and Drug Authority Second Inspection report). 2. 74% of wheat flour samples tested as part of the final inspection complied with food fortification standards (baseline 49%). (baseline: 9.5 million consuming adequately fortified oil and 11.9 million consuming adequately fortified wheat).